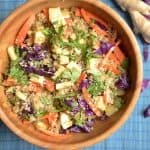 Delicious asian quinoa salad with a ginger vinaigrette and topped with fresh carrots, apples, cabbage, cilantro, and sesame seeds. A bowl full of goodness here! I love everything about this salad and there is so much to be happy about. The dressing is spiced up with fresh ginger, but salty from the Tamari Soy Sauce. Apples make a perfect contribution here with their sweet crisp taste. The carrots and cabbage provide the perfect crunch texture, and the cilantro and sesame seed topping makes the salad burst with flavor! I’ll admit that I am a “little” quinoa obsessed. Quinoa is my “go-to” food for lunch. 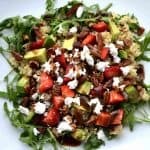 I love to create salad combinations that can last over a few meals so that it’s an easy grab and go lunch. 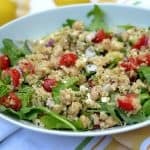 This is the perfect salad that I can now add to my quinoa rotation recipes. Usually when I make these salads, I will make it on the weekend when I have more time. I keep my dressing, quinoa, and vegetables all in a separate container. This just helps the salad to taste fresh even when consumed a few days later! If you are making for a group of people, go ahead and throw it all together. I love the combination of healthy nutrients in this salad as well. 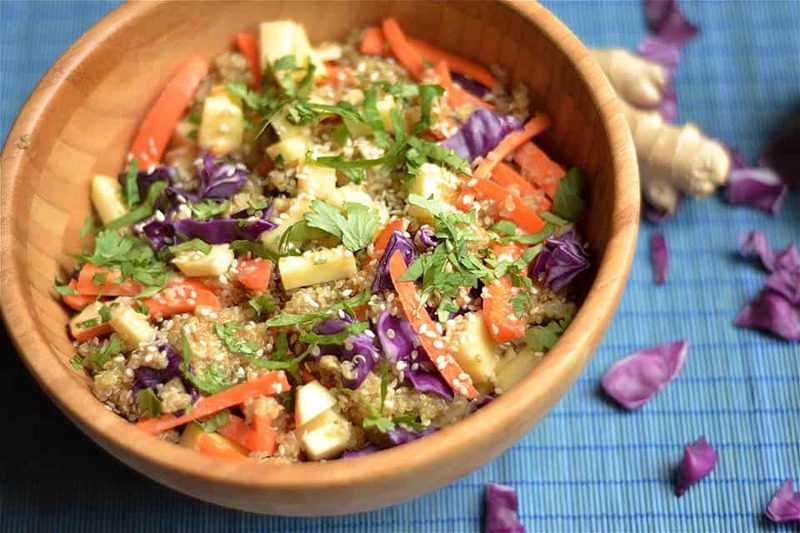 The quinoa packs the bowl full of fiber and protein, and the vegetables give us the perfect balance of vitamin minerals. Your entire daily recommendations of Vitamin A and C are met just within this bowl. Red cabbage and carrots are high in both A & C, not to mention folate, Vitamin K, and magnesium. 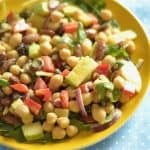 A simple salad that allows you to change things up from your normal routine! Serve with fresh greens, my personal favorite is arugula. Enjoy! Heat broth and quinoa in a small saucepan to a boil. Cover and reduce heat to low. Simmer for 15-20 minutes until water is completely absorbed and quinoa is fluffy. Meanwhile make the dressing: Add soy sauce, oil, vinegar, ginger, garlic and honey in a blender or food processor. Pulse until ginger and garlic are completely incorporated. 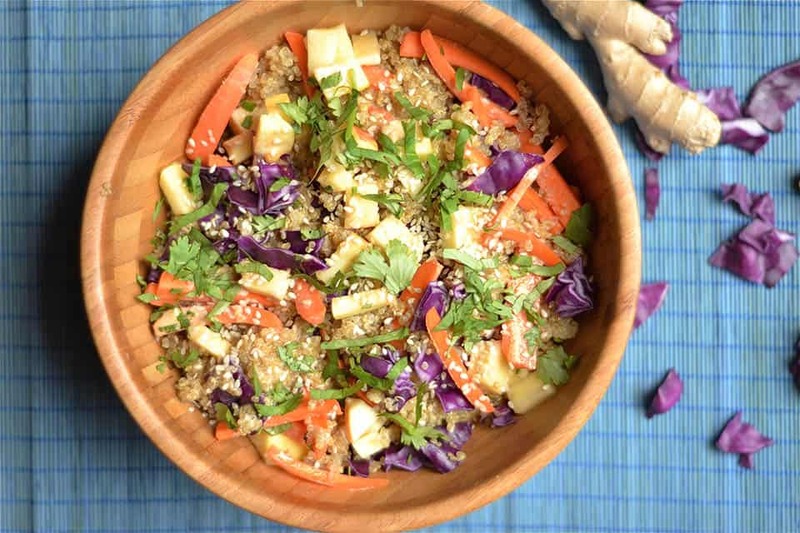 Once quinoa is finished, place inside a large bowl and cool. Add carrots, apple, and cabbage and dressing. Toss to combine. *Vegans can completely eliminate the honey, I would not substitute with anything else, just leave it without that tiny bit of sweetness. 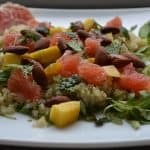 **If enjoying this salad over several days, read in the above post on how to keep it fresh (separate the ingredients).